Oh-great! Me and my baking mode and mood turned on. Attuned and lighted up like a bright wishing star. Having said that, seriously, I had no slightest idea what should be baking in my oven (Cream Puff, Marble Cake & Chocolate Rum Tart) or should it be over the stove simmering or frying sweet guilty pleasure (Poached Pears in Citrus Syrup, Grapefruit Coconut Jelly & Fried Apple Fritters). Honestly, I was rather confused. I really couldn't comprehend, but the fact was that I had already bought a ripe like me in my age mango (Mango Coconut Cake, Mango Cucumber Salad & Mango Coconut Jelly). Mango! Don't we all love the sweet tangy mango? I do. I also must include the sour notes from pineapple (Pineapple Bread Pudding) and lemon (Lemon Cream Pie & Lemon Buttermilk Cake). Yet, staring at the mango didn't get me any further until I remembered my previous No Bake Cheesecake. Decided. Its gonna be cheesecake. Mango Cheesecake. The same biscuit theory. Not digestive biscuits but cream crackers. Would you try? What should hold your back? After all, you never try, you never know and you must put your trust in me. Crumble crushed cream crackers and butter together. Press crumble into a greased springform pan. Leave it to set in the fridge for about an hour. Whisk both types of cheese with sugar over low speed until smooth. Add in mango puree and continue to whisk for a smooth consistency. Pour over the bottom layer. Bake on preheated oven at 180C for about 1 hour or until the top layer is fully set and does not jiggle. Cool down the cake and chill in the fridge. The cream cheese/marscapone blend are great together in cheesecakes and mango was a great choice of fruit. I am glad that you experimented with the crust some, I am always amazed at the variation that is out there. This does look like a winner-simply delicious! This is the second mango cheesecake I've seen in a few days, and I am so intrigued by the flavor combination! I would love to try this - looks beautiful! I am not a fan of cheesecake, I did not know that mango and cheesecake can complement each other. 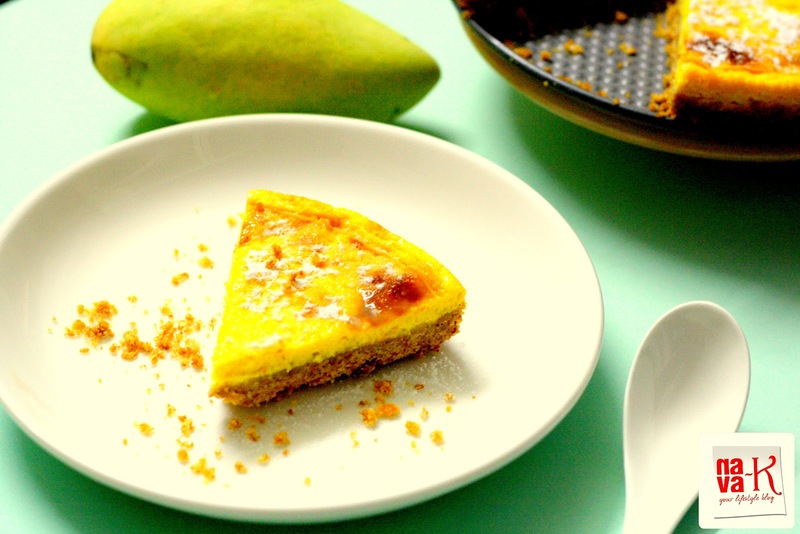 Your mango cheese cake looks beautiful. I like your idea of no bake cheese cake. Even I prefer it that way without eggs. I think you can start writing a cook book already! This no bake cheese cake looks yummy. Cheese no. Mango yes. How to choose??? will ask my sister tu bake for me... Print the recipe yer.....hehehe...nyum3x!! my sister like to bake a cake. OMG, no bake mango cheesecake sounds so good! I'm a fan of everything no-bake desserts like this, so just keep them coming Nava! Nava--that is such a pretty cheesecake. A beautiful color! 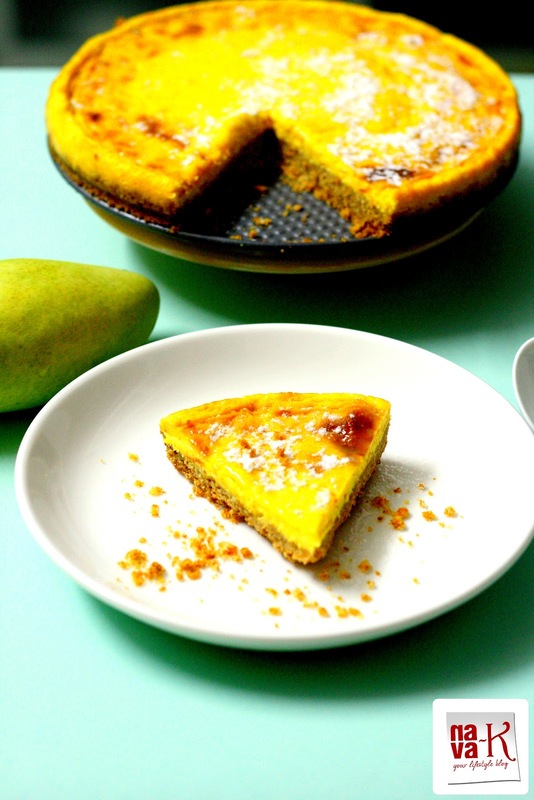 Love mangoes and cheesecake, what a perfect pairing. This looks really good and decadent. is it the mango or cheese which makes it look so yellow in color? it tempts me so much there! ripe mango for the sweetness right? Thanks everyone for all the wonderful comments, appreciate each one of it. OMG, this is really something spectacular! Mango cheesecake looks terrific. I want it, please. It looks very delicious... Thanks for sharing Nava. mango cheese cake. The name and the ingredients is already mouth watering. The pictures you posted confirmed a drooling reader. BTW, is this recipe still feasible without baking? Missy - I think some of those who commented here did not read through to realise that this cheesecake needs baking. I don't think this cake can be done without baking. Mouth watering! !Loved the recipe !! Looks very delicious !!! I love this cake! !